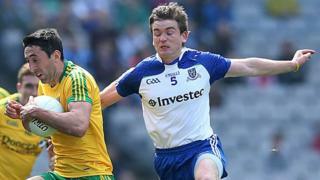 Man of the match Dessie Mone says Monaghan were delighted with their display in Sunday's Football League Division 2 Final win over Donegal. The Farney County repeated last year's Ulster Final success over the 2012 All-Ireland champions by earning a 1-16 to 1-10 win at Croke Park. Mone added that several of his Monaghan team-mates must have been contenders for the man-of-the-match award.